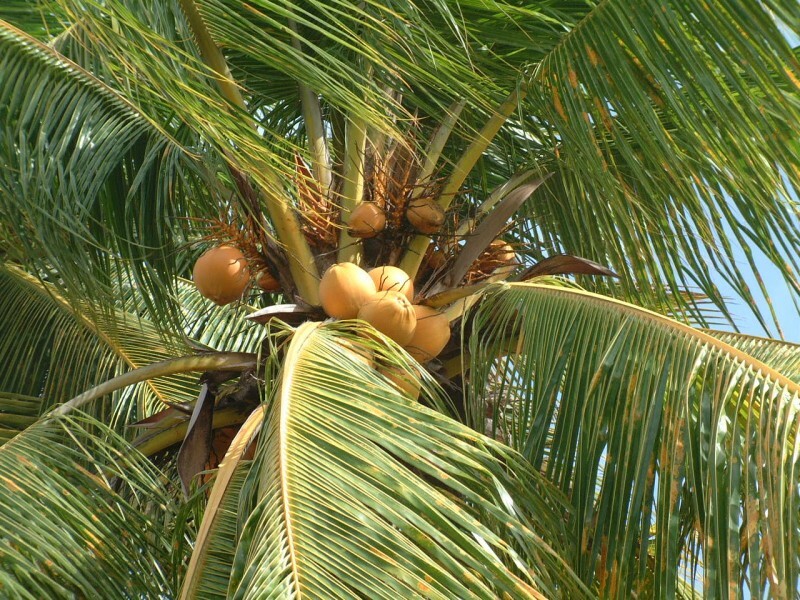 Coconut palms are prolific, and the nuts are used for sweet beverages (cut open as a "drinking nut"), or as the more familiar "dry nut", or coconut meat as we know it. 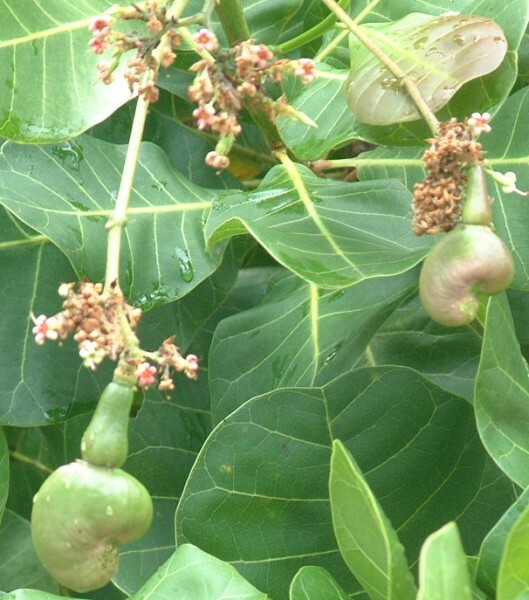 There is an intermediate stage, called "jelly nut" between the drinking and the dry nut when the interior can be scooped out as a sweet jelly. Coconuts are harvested commercially not only as eating nuts, but for making coconut milk, cream and as a base for cosmetics. 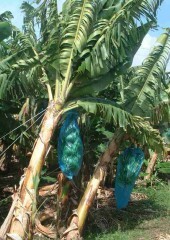 Driving around Martinique you see hillsides of dark green banana plants. 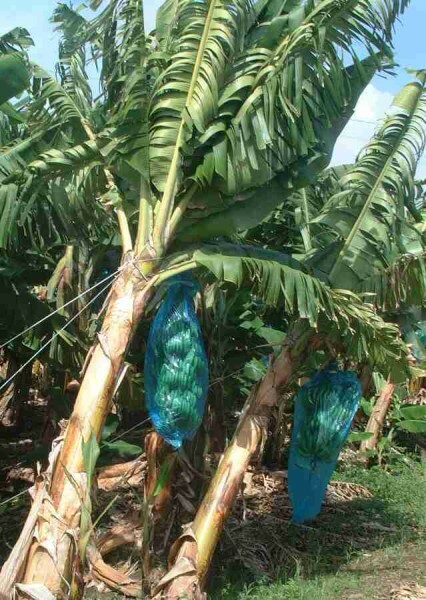 And yes, banana hands grow pointing up, and they are protected from insects and helped to ripen inside blue plastic bags. 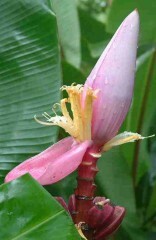 There are many species of banana, including the plantain which must be cooked before eating, the sweet little "figue", the fat red "bluggoe", and the common "banane desert." (Say that with a French accent and you'll see that they're talking about a dessert banana, not a desert one!) Normally the banana flower grows beneath the hand, but on this ornamental banana (right) the flower grows up! Breadfruit, though not native to the Caribbean is now abundant and a free food source for most anyone with a tree nearby. 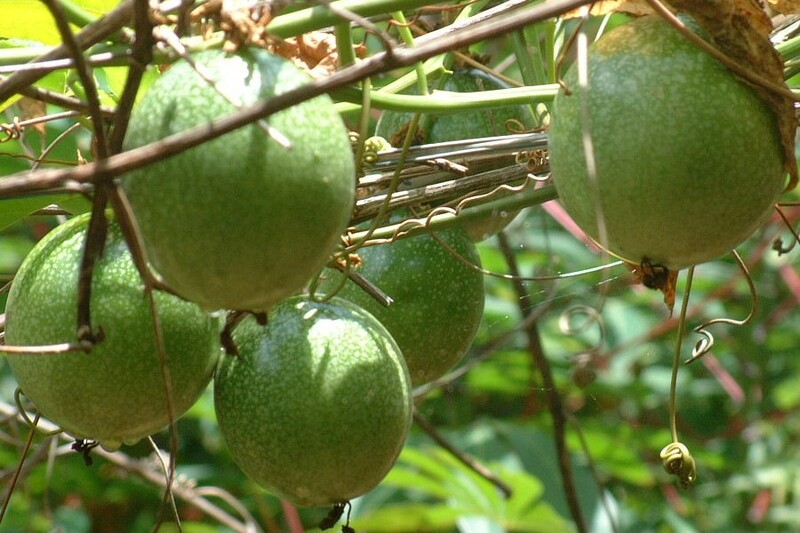 This large, pulpy fruit lasts only a couple days once picked, and therefore isn't exported from the islands. Captain Bligh is reported to have brought the first one to the island of St. Vincent hundreds of years ago, and its descendents still grow in the botanical garden there. 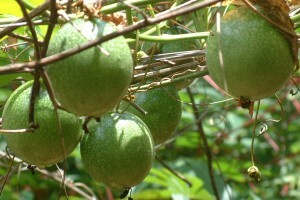 The fruit is peeled, boiled, and then eaten like a potato, or cut up and fried. There's a saying in Barbados (which I learned in 1981) that mango season is called "turn over da pot season", because you can turn over the cooking pot and live off the ripe mangos, they're so plentiful. That season is coming up, and we're looking forward to it, though I doubt we'll stop eating other food! 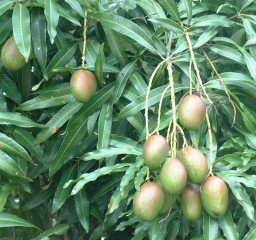 Some of the mango trees we've seen are well over 50 feet (16m) tall and dripping in mangos! Originally from India, the mango thrives throughout the tropics, and is thought to have been in cultivation for over 4,000 years. fruit, and must be roasted to be eaten. wrinkled, yielding a few spoonfuls of tart, seed-filled fruit. 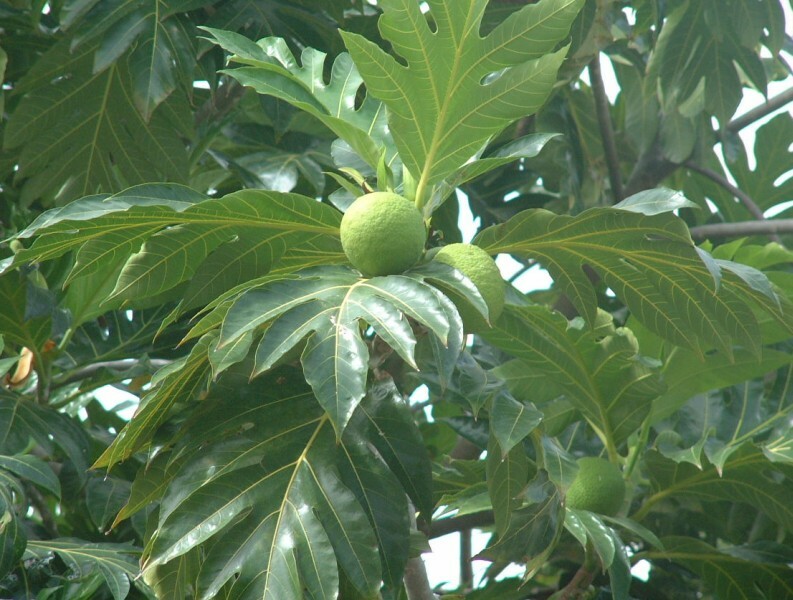 French areas as maracuja and in South Africa as grenadilla.